I read 'The Hunger Games' over the last couple of days. I enjoyed and admired the book a lot: I work on and off in children’s books so I have a good, if sometimes depressing, idea of what’s been popular in teen fiction of late. Having been left entirely cold (or rather angry) by what I’ve read of the 'Twilight' books, and left entertained by but extremely critical of the 'Harry Potter' books, it’s nice to find that it is possible for a wildly popular book to also be a very good one. Not unrelatedly, I’ve also been thinking a lot about the prevalence of female leads in current Young Adult fantasy novels. When I found myself struggling for suggestions when asked for some good recent Young Adult fantasy with male leads, I realized quite how much things have changed since the trend of own teen years where girl heroes were the exception. So I'm interested in spending a little time comparing and contrasting the girls that head up (or, in one case, help to head up) the most successful Young Adult franchises of recent years. The selection has an element of arbitrariness in that there are equally prominent franchises left out on the basis I haven't read them (the Percy Jackson books spring to mind). Or haven’t read them recently enough to be accurate (Skulduggery Pleasant, for instance). But I think there is some value in comparing these particular texts as together they are broadly the most prominent in the recent wave of Young Adult fantasy with leading women. I'm going to go ahead and assume that readers are already familiar with the basics of these franchises. 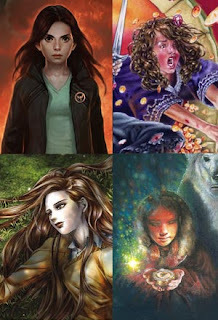 So: Bella Swan, Katniss Everdeen, Hermione Granger and Lyra Silvertongue (nee Belacqua). Talk about girls in Young Adult fiction right now and people think of Bella Swan - likely with a good deal of eye-rolling contempt. The lively hate-dom of the series certainly dislikes the character, or what she represents. Even fans of the books often seem to have an opinion of the character ranging between sympathetic indifference and active dislike. If people like the books, it seems, it's not because of Bella Swan. Quite why Bella leaves people cold as a character is something I want to talk about a bit below. One of the accusations frequently leveled at the series is that its heroine is incredibly passive, and it's hard to argue with the appraisal. Bella's life is affected by the actions of others, rarely by her own actions. Her great catalyzing feat in the series is falling in love (and the second big catalyzing feat is starting to develop possible feelings for another). What happens because of that happens to Bella, not because of her. The series is in theory based around big, difficult choices that Bella has to make: will she marry; will she become a vampire; will she give up the chance to have children; will she choose Edward or Jacob. However, ultimately, each of these dilemmas is resolved by circumstances out of Bella's control. She is in a tradition of female heroines (e.g. Tess of D’Urbervilles) whose personal volition is limited and are important to the story they inhabit mostly as motivators of the actions of other (male) characters. It's a character type, fittingly, codified in gothic fiction (which is not, of course, to say that all heroines of gothic fiction occupy this role - see Jane Eyre). In The Hunger Games, the role of heroine Katniss Everdeen in her own story is far more active. It's worth noting that there is great potential for passivity in the scenario around which the book is based: the premise of ‘The Hunger Games’ is that teens are selected at random for the inescapable, titular death-match. Suzanne Collins chooses not to have Katniss enter the Games through random fate, though. Rather, Katniss is presented with an early difficult choice that sets the pattern for difficult choices: save herself or protect her sister. The fact of Katniss' volunteering, and her motivations for doing it, are early marks of a character who is a character - who has choices to make and personal reasons for making them. As Katniss moves through the story she changes and is changed by the events of the books. The consequences of her previous choices pile up and the stakes are raised. Bella is passive but it is not this that makes her a bad character. If we are in the business of seeking good characters rather that Strong Female Role Models, a character in Bella's shoes might well be uninspiringly passive but also full of fascinating character detail. Bella is, of course, not. By Meyer's own agreement, Bella Swan is to some degree a reader-avatar, and she is really more a vaguely sympathetic cipher rather than a true character. Bella is not one-dimensional, but in fact, entirely dimensionless. She never exhibits any personality trait distinctive enough to be called a dimension. You can't build a personality, even a cardboard cutout personality, around traits like, 'is in love' or 'is mildly clumsy'. Katniss fares much better than Bella. She has a collection of distinctions - her skill in hunting, particularly with the bow; her varied, sometimes conflicted relationships her existing family and friends; her oft-mentioned taciturnity. But in my opinion she is still somewhat lacking in real personality as a character. Partly the problem is that though this set of traits is mentioned they are not really satisfactorily demonstrated or examined. For example, we are told that Katniss is taciturn, but this is never really shown in any of the action we see. We are repeatedly told of her devotion to her sister Primrose and even offered supporting anecdotes - but in the moments that really matter, like their final parting in the book, there's no real sense of distress in Katniss's narration. It's difficult to really know what to make of Katniss on the evidence provided, and our involvement in her choices is therefore limited. The dilemmas with which she is presented with are so stark we can appreciate their weight on a general level, but I for one never felt fully engaged with Katniss's personal emotional conflict because I never fully understood what her fundamental personality was. The problem - insofar as there is a problem, I still rate ‘The Hunger GamesS’ highly - for me, lies in the Collin's writing in these moments. She just falls short of an ability to convincingly be in the moment with Katniss so even though the reader is inside the character's head, we feel emotionally distant from her inner conflicts. Where scenes are moving, or exciting, or scary, it is because the action is generically moving, or exciting, or scary, and would be whoever was involved - not because we feel any special concern for Katniss and how she is experiencing the moment. It's actually an interesting feature of a book that comments on the storytelling of reality TV as ‘The Hunger Games’ does. We are asked to share Katniss's disgust in a Capitol audience who treat the slaughter of innocents as entertainment. We along with her feel cynical contempt for viewers that can be swayed in their sympathies by constructed romantic whimsy. At the same time the same events that the audience are enjoying are the entertaining action that the readers too are enjoying reading about. Katniss and Peeta's romance is real as well as fake and we are asked to care about that relationship in the same way that the in-universe audience is asked to. We, unlike that audience, may be privy to Katniss's inner life in a way the in-universe audience cannot be. But the emotional distance that remains means there is an edge of voyeurism to the reader's enjoyment. We are watching Katniss rather than being Katniss, and what is more have invaded the one place the cameras cannot permeate in-universe: her own thoughts. Hermione Granger is the exception amongst these girls in that she is not the primary protagonist of her series. Harry Potter is more of an ensemble piece than the name implies, of course - although we as readers never leave Harry's side, his best friends Ron and, particularly, Hermione are almost as central as Harry himself. Hermione gets as much of the story-action as anyone bar Harry himself. This secondary-character status in some ways actually works to make her a more interesting character. I myself find Harry a little flat as a character, having the sort of criticisms of his writing as I do of, say, Katniss's. That is, that they both feel a little generic, a little lacking in really interesting or distinctive character traits, and a little distanced from the reader emotionally. I never really feel empathetic for Harry. Like with Katniss, I can share his reactions to events that prompt those feelings in me, but I never feel anything about events because Harry is feeling it. I simply don’t believe in him to that extent. In writing supporting characters like Hermione, Rowling is freed of the pressure to provide a sympathetic protagonist who must carry the series. Rowling allows Hermione to be far more interestingly mixed in her virtues and vices than she does Harry. Furthermore, we are able to view her character from an outside perspective, since she (unlike any other the girls discussed here) is not a viewpoint character. Her personality therefore stands out all the more clearly as she is described on first introduction via Harry's appraisal of her. When Harry first meets Hermione he has no reason yet to view her particularly forgivingly and in light of her early actions dismisses her according to the worst excesses of Hermione's bad points. They only become friends when Hermione demonstrates dramatically that there is more to her than being a bossy know-all. She thus earns her place in Harry's affections, and simultaneously, in the readers'. She follows up on this initial indication of having more to offer than we first might have thought by continuing to emerge and develop throughout the whole series. In fact, I would argue that of the three main characters she has the most development throughout the books, and her arc is the most engaging. That she starts out being portrayed as positively unlikable, so abrasively pronounced are her character trait, is in stark contrast to a character like Bella Swan who is so ill-defined as a character the only aspect one could find to dislike would be that very vacuity. Meanwhile, Hermione learns to embrace her personal strengths, smooth the edges from the more abrasive points of her personality, and discover new strengths as the series progresses. She ends up both very recognizably the same person as 10-year-old, Philosopher's-Stone-Hermione, and at once a wholly developed and matured young adult. We believe in Hermione as we first meet her, and believe the ways in which events change her. I am far from an uncritical reader of HP. I have a problem with the incredible conservativism of the stories which are old-fashioned not just in tone but also in (small-p) politics. I think Hermione's character arc is one of the most successful elements in the books, but she is also basically a stock female character. The character of the bossy know-it-all girl sidekick (even one who grows into a more rounded person) is not new enough to be really interesting and Hermione can hardly claim to have much of an original spin on the type. Ultimately she is well defined enough to be engaging and well written enough to be sympathetic, but remains a workaday character. Lyra for me is the most interesting and engaging character of the set, (though I am not without criticism of the writing of her either, as I shall set out below). Like Bella and Katniss, Lyra is the protagonist of her series, but like Hermione her story is told in the third-, not the first-person, and the narrative does not follow her exclusively, as Katniss’s and Bella’s narratives follow then exclusively. Therefore Lyra, like Hermione, benefits from the more objective view that third-person-omniscient narration is able to offer. Also like Hermione’s, Lyra’s story does not always describe its heroine in exactly glowing terms, especially in her earlier chapters. We are told she is 'a coarse and greedy little savage' on the whole, and her tendency to operate with systematic lying and slyness is both explicitly imparted to us, and demonstrated in the early action. We can see for ourselves that her actions are sometimes childish or stupid or immoral, and far from defending her, the narration often takes a tone of affectionate contempt for the ‘half-wild cat’ it describes. We sometimes feel distant from Lyra in these earlier, establishing chapters: watching with interest what this girl will do next and increasingly anticipatory of some interesting responses on her part to the unfolding action - but not yet really invested in her emotionally. As we follow Lyra through the book and as her actions and reactions reveal and develop her less course sensibilities, the reader grows to have more empathy with her. Pullman's success in making us care deeply about this girl is a vital, as well as an impressive, feat of storytelling in ‘Northern Lights’. The story and themes of the book succeed or fail according to how much we care about what Lyra cares about. The drama of the big climactic pieces of the story is based around Lyra's emotional stake in what's going on. Yes, there are some set pieces – battles, bear-fights, world-bridging – that would be dramatic stuff regardless of how we felt about the people involved. But the cores of these action scenes are the emotional involvement that Lyra has in them. For example, without caring about Lyra's relationship to her daemon Pantalaimon, the climactic scenes in which is nearly parted from him forever would be meaningless to us. We care not because the situation is objectively terrifying – if you opened the book on that scene and read it without any knowledge of the rest of the story, you wouldn’t have any idea what everyone in the scene is so excited about – but because Pullman has very effectively established how much Lyra cares about Pantalaimon – and we care about Lyra. So I feel Lyra is a more successful character. Her feelings are particular to her, rather than the generic reactions anyone might have. The actions and behaviours in which we see her engage (most importantly in the earlier chapters) serve to build a consistent view of her character and give her a chance to demonstrate her tendencies to the reader rather than Pullman simply telling us what they are. She becomes more than the sum of the separate facts we are given about her. Lyra and Hermione both step from the page of their stories and become people we can believe we know, people we can imagine existing outside the boundaries of the actions on the page. Like friends we know well, we can predict their reactions to events, though these people sometimes surprise us too. We can imagine details of their lives never explicitly discussed: what their favourite food and books might be, or what their rooms would look like. By the time Lyra is really entering into the main action of the book we are well acquainted enough with her to feel interested in how this particular character will deal with what's to come, and concerned on her behalf. Pullman has carefully put her through stresses that bring out her most fundamental loyalties with sharp, affecting poignancy. For example, Lyra's confrontation with Mrs. Coulter in chapter 4 is important narratively because it shows the growing strain in the relationship between the woman and the girl. But the nature of the confrontation, involving Coulter's daemon targeting Panatalimon, has another function too: Lyra's vividly described distress engages our sympathies and understanding of the depth of her relationship with Pantalaimon. By the time their bond is threatened at Bolvangar, there has been enough off this sort of action to wholly persuade or most empathetic urges. In Katniss's story we care because the events are objectively sad or scary. They would sad or scary for anyone. We sympathise with Katniss for having to endure what none of us would like to endure, but have to special appreciation of why these moments are particularly sad or scary for her in particular. In fairness, the focus of Katniss’s story and Lyra’s are different. The Hunger Games is primarily an action adventure, and unlike ‘Northern Lights’ does not live or die on its ability to engross us in the workings of its lead character. But for comparison within the action genre look at the Bourne films, which are an example of an action hero we’re happy to watch in scenes where he’s not beating people to death with a rolled-up newspaper but in fact quietly mourning the death of his girlfriend, or apologizing to the daughter of former victms. We care more about Bourne because we believe in him as a character. We might not be able to see into his thoughts – he doesn’t even say very much – but he’s well-drawn enough that we believe in him. We are sad, for example, when Marie dies partly because it is objectively sad that a person has died, and partly because her character was also well drawn and we believed in her too - but mostly it’s sad for the audience because we feel for Bourne. We’re there with him in his loss, able to know what he in particular must be experiencing based on the particulars of his personality, and the particulars of his and Marie’s relationship. Lyra's progression into a more mature version of herself throughout her first outing ('Northern Lights') is handled with the craftsmanship of a true storyteller. The action of the book subtly but surely takes her through actions and choices that force Lyra into a new version of herself. She loses none of her fierce sly wit or her impulsive bravery, but gains maturity in her evaluation of other people, and hones a personal morality. Like Katniss, her choices are difficult and the path of righteousness often unclear – and often entirely unavailable. But Lyra's arc is probably more successful than Katniss's, the latter of whom doesn't particularly change in outlook or maturity from beginning to end of book. Again, this is not necessarily a problem for ‘The Hunger Games’ as they are focused on action. Another important point is that Lyra is less lucky than Katniss. Or perhaps the phrase is less sure-footed. Katniss professes to be unsure about her courses or action but is consistently rewarded with positive outcomes for her choices, regardless of what motivates them. She is apparently charmless, but through a mixture of uncalculating admirability and actually very skillfully played disingenuous charm, charms the crowds into rooting for her and sponsoring her well. In a foolish show of anger, Katniss ruffles the feathers of the Game-makers – but the outcome is good for her, with them rewarding her skill rather than punishing her insubordination. Whether Katniss acts from genuine feeling or calculates her actions for appearences’ sake; whether she decides to trust a character or not, she has always made the best choice possible. It’s like what TV Tropes calls The Worf Affect. The Worf affect can be defined thusly: in Star Trek: TNG, to demonstrate quite how scary the Alien Of The Week was, they would usually be shown overpowering Worf, since everyone knew he was the toughest crew-member. But since he was more consistently shown being pwned than actually being successfully tough, the effect was to make Worf look like a weakling. The point is that you can tell your audience something as much as you like, but so long as you’re showing something else no one will buy it. In Katniss’s case, her oft-referenced taciturn lack of charm is hard to buy as a real weakness or risk for her since we never see it causing her problems quite the opposite. Collins might insist Katniss is bad at all that girly stuff and has no charm or ability to lie – but she doesn’t ever prove it, so it’s hard to believe that against the evidence of her success in fooling both the public and Peeta in extremely difficult circumstances. In fairness, in the life-or-death scenario of the titular games, it would be difficult for Collins to have Katniss make a bad call without it resulting in the character's immediate death. But it is another reason I never felt quite emotionally there with Katniss; because there was no doubt in my mind that she would be anything less than personally successful in her actions. Lyra, meanwhile makes bad calls frequently and has to recover, using, her strengths trouble her more treacherous traits have gotten her into. So Lyra, for my money is the best-written character of the set. Just in conclusion I might mention what I don’t like about Lyra’s character. I've mostly talked about Lyra in 'Northern Lights'. Since 'Northern Lights' is the part of the trilogy most focused on Lyra's character and her development, it seems valid to base criticism of same mostly around that book. But it should also be noted that my admiration for the writing of her character decreases gradually then sharply in the following books. In ‘The Subtle Knife’, Lyra's self-determinism derails into mere misguided willfulness. I feel it has a lot to do with the appearance of the male lead, Will Parry. With the second book of the trilogy primarily focusing on his development, Lyra's character gets cast, justifiably, into a support role. Since she is such a capable and dominant character by nature this seems to necessitate the rewriting of her bravery into blind impulsiveness, and the reduction of her quick wit. The partnering of Lyra with another lead has the effect of flattening of all Lyra’s previously rounded characteristics into 2-D versions thereof, perhaps because without this change there would simply be no space for Will as a main character: Lyra as we know her from 'Northern Lights' wouldn't need this boy. The relegation of Lyra somewhat into a supporting role is forgivable in 'The Subtle Knife' where it is Will's turn to play the main character with the most development, and even the incompetence I feel she demonstrates as compared to her competence in 'Northern Lights' is understandable in the context of the book: she is literally out of her own world and can be forgiven for not navigating this new world with the ease she does in her own. The place I really start to have a problem with the writing of Lyra's character is in 'The Amber Spyglass': her full fall from proactive heroine status to passive motivator for male lead Will is marked by her spending the opening several chapters playing Sleeping Beauty while Will navigates unfamiliar worlds with unfailing competence to find her. Even when she wakes up her role is to be largely passive or, again, misguided in her actions. Her role is to feel sad without her daemon, to feel sympathy for the ghosts and later the Authority, to fall in love. Her emotional response to events spurs Will to act. She emotes while Will does. It seems unforgivably retrogressive in a character that started out as a great active hero who happened to be female. It is interesting to me that while I recognised little of the Lyra I love in 'The Amber Spyglass', I feel the real Lyra re-emerges in the short sequel story 'Lyra And The Birds' from the 'Lyra's Oxford' book. This is a girl who is very recognisably the same person as the child in 'Northern Lights' but now convincingly grown into a young woman. She is not infallible, nor independent of help, but without Will's presence Lyra is able to once again operate on her own terms and is much the better character for it. I'm glad the Lyra I love was not lost forever.